And the trend isn't slowing down. Quite the opposite in fact. Back in 2010, Nissan introduced the Juke to the world. Those who saw past its funky-looking front end knew it wasn’t much more than a jacked-up small car; it shared a platform with the Micra and several Renaults. Its then closest competitor was the more expensive Mini Countryman. Despite the snickering, the Juke quickly outpaced sales expectations, and competing brands took notice. The age of the affordable, small crossover arrived and it’s now stronger than ever. Look at the responses: Chevy Trax, Buick Encore, Jeep Renegade, Mazda CX-3. And more small cars turned into small crossovers are coming very soon. Luxury brands also fully understand how profitable small CUVs are, hence the BMW X1, Audi Q3, and Lexus NX. But it was the Juke that proved that buyers, especially young ones, like quirky over conventional small hatchbacks, sedans, and some coupes, such as the Honda Civic coupe. Aside from a higher seating position, CUVs of any size and price, like their SUV predecessors of the 90s, are now something of a status symbol. 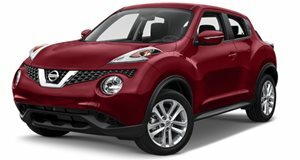 And it was mainly the Juke, weird design and all, that’s turned jacked-up small cars into an insanely profitable segment.